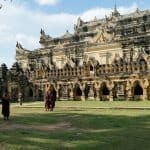 After the fall of the Pagan Kingdom in Bagan due to several Mongol invasions, Myanmar split into smaller (city) states. But the kings who ruled along the Irrawaddy in Sagaing, Inwa, Amarapura and finally, Mandalay, conquered the lands – at one point even expanding the kingdom to Ayutthaya, Thailand – and returned Myanmar to its imperial glory. 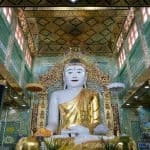 The following is a 1-day itinerary for visiting all three royal capitals, Sagaing, Inwa, and Amarapura. 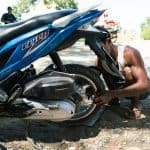 You can either rent a motorcycle/scooter in Mandalay and follow the route on your own. 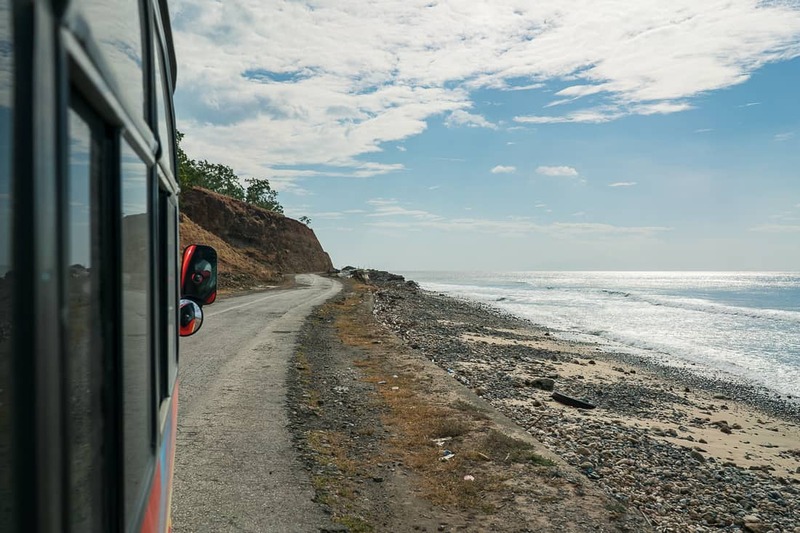 Or you book a motorcycle or car with driver to take you around. Note: I provide more info on Mandalay and planning your trip to the region here: Mandalay, Myanmar’s Spiritual Center & Last Royal Capital. 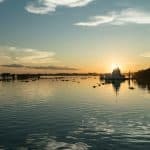 While Mandalay, Amarapura, and Inwa are located on the eastern banks of the mighty Irrawaddy (aka Ayeyarwady) River, Sagaing, the oldest of the four Mandalay royal capitals, alone sits on the western banks, about 20 km south of downtown Mandalay. Two cantilever bridges connect the two sides of the river: Further North is the larger, modern Yadanabon Bridge. 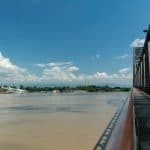 The English-built Inwa Bridge, a few hundred meters to the South, was once considered an engineering marvel as it spans the Irrawaddy; it is still the railway bridge. 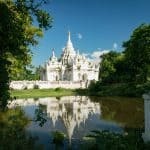 The Sagaing Kingdom of the 14th century was one of the minor kingdoms that rose up after the fall of Pagan dynasty of Bagan fame. Sagaing’s status as royal capital lasted only 50 years, and while it was replaced by Inwa (or Ava) in 1364, the crown princes would still reside in Sagaing, and in the 18th century, King Naungdawgyi set up his court in Sagaing during his brief 3-year reign. 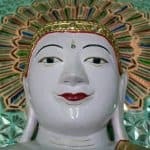 Today, Sagaing is a spiritual center of Myanmar. 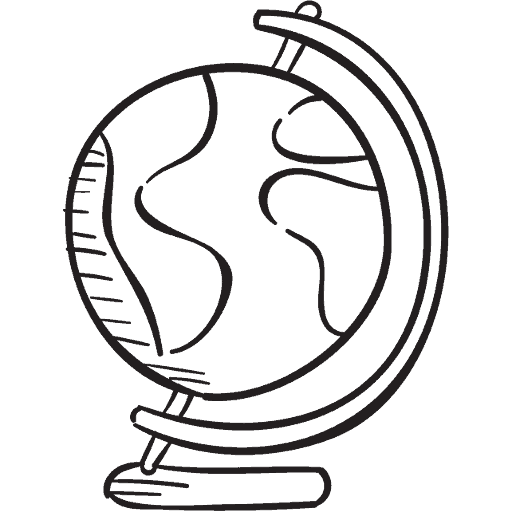 The Sitagu International Buddhist Academy was established in 1994. And Sagaing Hill is littered with big and small pagodas as well as caves used by the monks as dwellings and temples. Enter the city via Yadanabon Bridge (the first one you will reach from Mandalay). 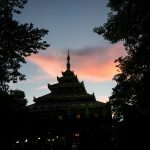 Stop at the Sitagu International Buddhist Academy: The main pagoda not only has an unusual dome-shaped golden roof, around the building (which was shut at the time of my visit), you’ll find dozens of Sitting Buddha sculptures from different periods and from around Asia. 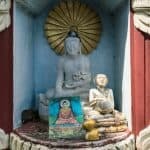 I loved exploring the various regional features: Pakistani Buddhas are wearing an outfit that is covering more of the body than, for example, Buddhas sent from Indonesia; Cambodian Buddhas have the features made famous by the sculptures found in Angkor temples such as Bayon. 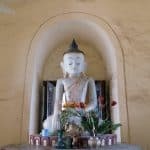 Before heading up to Sagaing Hill, make a quick stop at Tilawkaguru Cave. 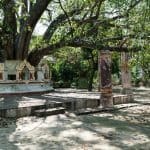 The site is tiny, and you cannot enter the monk dwellings, but there are no crowds here and plenty of little things to discover, like the colorful columns built to support the thick branches of the Banyan tree in the courtyard. 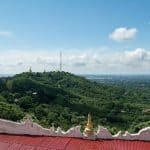 Sagaing Hill will without a doubt be the highlight of your visit to Sagaing. 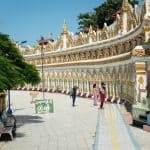 If you have time, take a few hours to trek up and down the covered stairways (called saungdan in Myanmar) to go from one golden pagoda to the next, passing caves painted in crisp white. 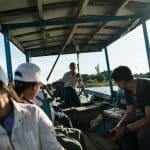 This tour is best organized by having a taxi drop you at the top and then meandering down to the river. First at the Umin Thounzeh Paya for its endless line of sitting Buddhas in a turquoise round on the lower level and the perfect view of Sagaing Hill from the upper level. 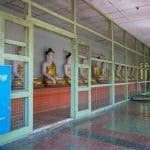 Then head up the road to Soon U Ponya Shin Pagoda (also called Swun Oo Pon Nya Shin Paya). 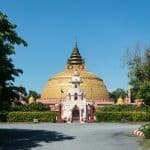 Soon U Ponya Shin offers the best views of Sagaing (including the Sitagu International Buddhist Academy) and the Irrawaddy River all the way to Mandalay Hill. 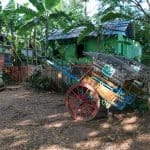 If you have more time, this is a great starting point for further explorations of Sagaing Hill. 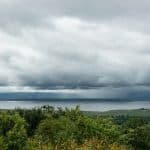 You’ll also find a few eateries and stalls selling cold drinks and fresh fruit up here or along the way. 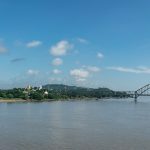 Leave Sagaing via Inwa Bridge for – surprise! – Inwa. 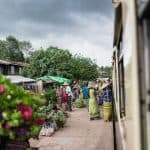 In 1365, the capital of Myanmar moved across the river to a city we now know as Inwa (also: Ava, Awa, or Innwa), but back in the Kings’ days, the city was called Ratanapura, Gem City in the local Pali language. 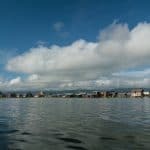 The construction of the new city was a major project that involved filling in nine lakes; some say the name Inwa is derived from those lakes (in Pali, “nine lakes” translates to Innawa). 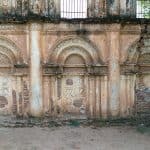 Despite being destroyed by invaders and powerful earthquakes several times, it was rebuilt and remained the capital of successive Myanmar kingdoms for the better part of the next 500 years. In fact, Myanmar (or Burma) was known as Ava in Europe before the English colonized the region. 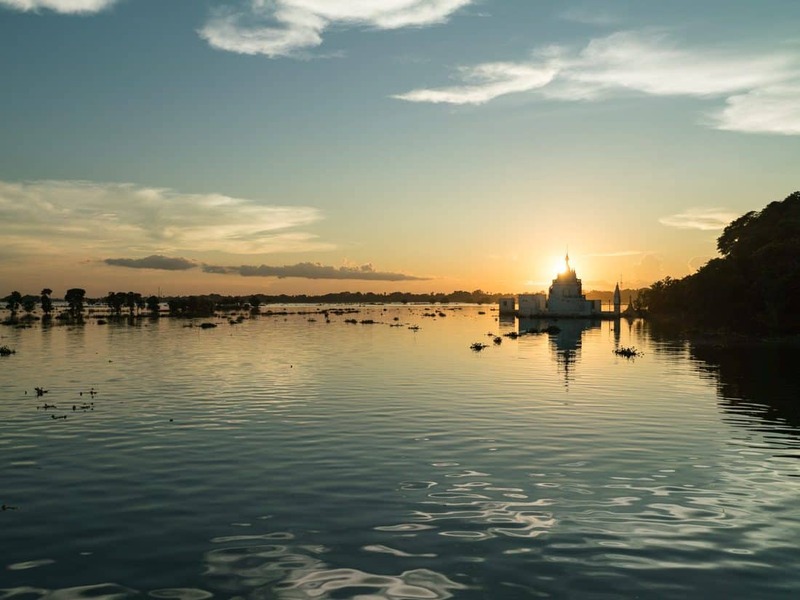 Only when a series of major earthquakes in March 1839 destroyed almost the entire city, was the new capital built in Amarapura. 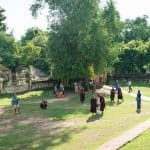 What makes Inwa so charming and worth a visit when you’re in Mandalay is that, while it is today merely a collection of houses that don’t even merit the designation “village,” the remains of the golden days are visible all over. From the grand access road to the numerous brick stupas (not dissimilar to those I found in Thailand’s Ayutthaya) dotted in the landscape to the remains of massive pagodas seemingly out of place. To fully appreciate Inwa, I recommend entering the city the long way from the Tada-U roundabout. Coming from Sagaing, there is a boat conveniently crossing the Myitnge river shortly after Inwa Bridge. But we’ll keep that ride for later. Go along the straight, tree-lined avenue, past the cows lounging on the warm pavement and the houses with small shops set up outside, and feel like a queen (or king) coming home. As this road makes a slight turn to the right, you will see the first ruins of brick pagodas. 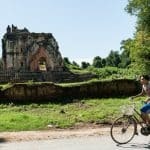 Have a wander about here or, turning right and then directly left again to stay on the main road into Inwa, go for another 200 m, look to the left and be stunned by the remains of Lay Htat Gyi. 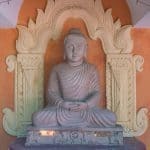 You want to go closer, climb the massive staircase and have a look at Buddha sculptures and stucco dragons. That there must have been some (failed) reconstruction efforts in the past 20 years doesn’t lessen the impression this building leaves behind. Continue on the main road, but don’t cross the large channel into the ancient city walls, yet. Instead, turn left for Bagaya Monastery. 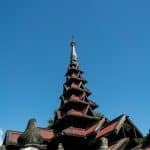 Traditionally, Myanmar monasteries were constructed from teak wood. At Bagaya Monastery, it provided both, massive beams allowing for structures of 57 meters in height and a material flexible enough for fine carvings along the outside of the building. 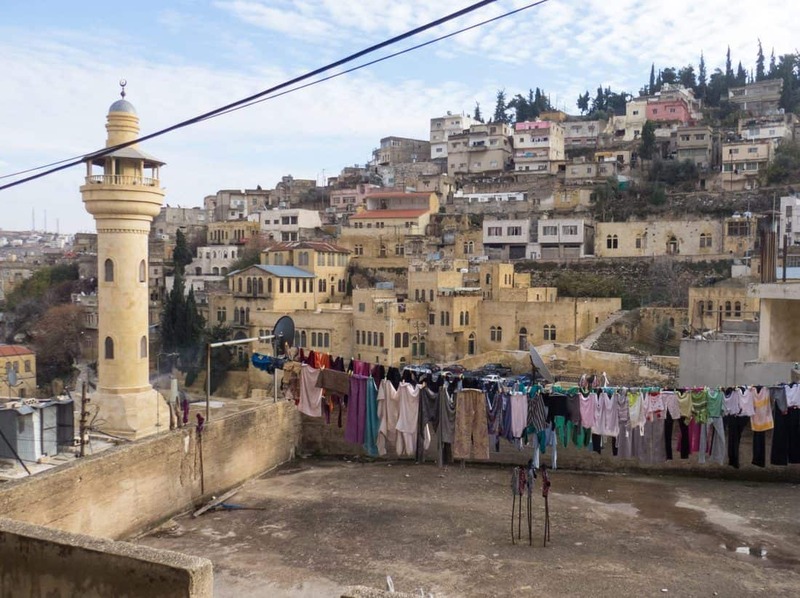 The foundations of the monastery date back to the end of the 16th century. It served as the “royal college” for several generations, before a fire destroyed it. The current Bagaya Monastery is a faithful reconstruction of 1770s sketches from the 1990s. After the Bagaya Monastery, enter Inwa via the Southwestern bridge. Go straight until Desada Taya (White Temple) – a small, beautifully fragile white pagoda in the midst of fields. Turn here to the left for Nanmyin Watchtower. Do not make the same mistake I made to go straight until you see the watchtower across a banana field and follow the small dirt track leading into the field – it will become a narrow mud fest with few options to turn your scooter. No, just turn onto one of the larger roads instead. Nanmyin Watchtower is all that remains of the mighty palace of King Bagyidaw. You can no longer climb the outside stairs as successive earthquakes, and lack of maintenance are beginning to take their toll. 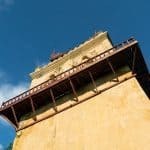 In 1821, the King’s Primary Queen, Mae Nu, ordered the construction of the final sight in Inwa, only a few hundred meters down the road from the Nanmyin Watchtower: Mae Nu Oak Kyaung (“Mae Nu’s Brick Monastery”). Its massive brick walls, clad in bright yellow rendering marked a departure from the traditional teak style. 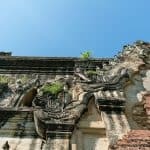 Sceptical as the people might have been, it also meant that it withstood the massive earthquakes with less damage than the rest of Inwa. 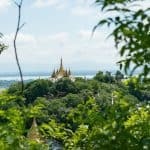 At Mae Nu Oak Kyaung, make sure you wander behind the main site where you can find smaller buildings and beyond a fantastic view of the Irrawaddy and Sagaing. When you have adequately explored Inwa, it is time to turn back to Mandalay. This time, we’ll take the boat. A dirt road leads down to Myitnge River, which feeds into the Irrawaddy. The small boat leaves every half hour or so and is free for passengers on foot. Motorcycles, however, pay 2,000 Kyat. On the road back towards Mandalay, take a right shortly after you’ve crossed the train tracks. Now you’re in Amarapura. The “City of Immortality” first became royal capital at the end of the 18th century but a fire in 1810 lead to the relocation of the court to Inwa (Ava). It was briefly used as interim capital after the 1839 earthquake erased Inwa but lost its status in 1859 to the new Gem City at the foot of Mandalay Hill. 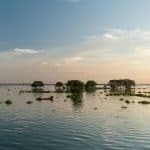 Brief as Amarapura’s reign as royal capital may have been; the city has left a major impact on Buddhism and politics elsewhere in the world as Sri Lanka’s Amarapura Nikaya was founded in and named after this very place. 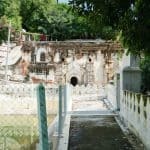 While there are a few pagodas and royal palace remains dotted about what is now a suburb of Mandalay, the main attraction is U Bein Bridge (also U Bei Bridge or U Bain Bridge) spanning the waist of Taung Tha Man Lake. Built in 1850 and with a length of 1,200 m, it is the longest teak bridge in the world. 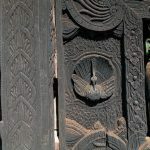 The wood was reclaimed from Inwa’s royal palaces. 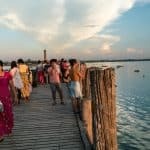 Arguably the best time for photos of U Bein Bridge and the lake is the early evening. However, locals and tourist alike know that sunset at U Bein Bridge is lovely and come 5 pm the bridge is usually buzzing with people looking for the best shots. 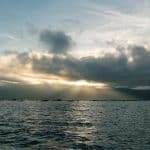 Visit for sunrise, instead, and you’ll have the bridge practically to yourself and share the lake only with the fishermen. 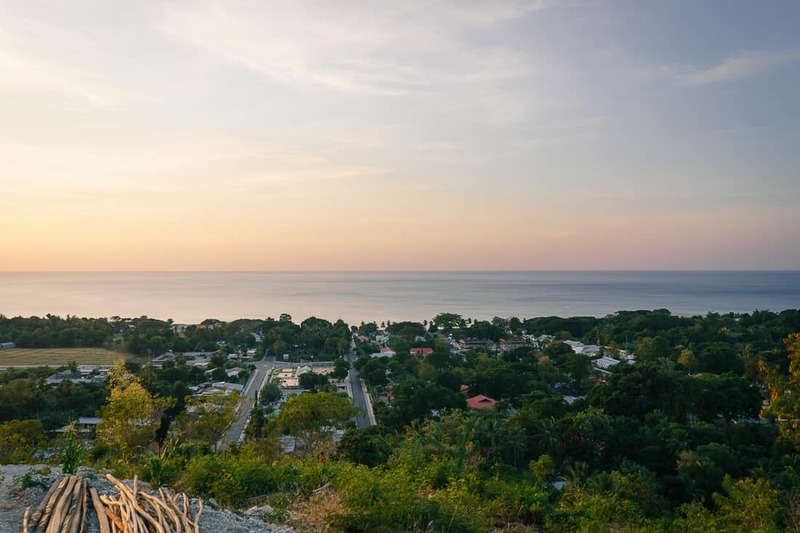 If you come here for sunset, know that parking is limited, but as long as you leave before 7, you can park at the Mahagandhayon monastery. Also, there is a night market and restaurants along the lake road for dinner and a café on the eastern side of the lake for breakfast. Entrance to the active temples in Sagaing, Inwa, and Amaparpura is free. 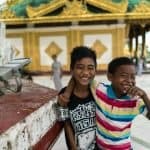 However, in some temples, a photography fee of 300 to 1,000 Kyat applies. 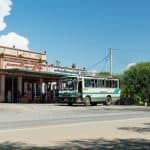 Entrance to all other sites in Sagaing, Inwa, and Amarapura is covered by the Mandalay Archeological Sites ticket, which costs 10,000 Kyat (10 USD) and is valid for five days. 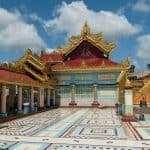 Please reference my main Mandalay guide for more practical info to plan your visit. 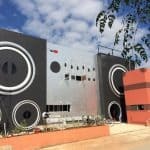 For your visit to Mingun, please refer to this guide.